This member of the Orchidaceae family was given this name by Robert Allen Rolfe in 1897. It is found in the trees of Cameroon, Equatorial Guinea, Gabon and Southern Nigeria, growing in hot and damp conditions with lots of water and little to some sun. 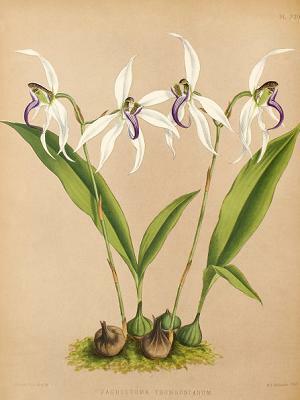 The pseudobulbs can grow to three centimetres, the plant up to 20 centimetres high and 25 with the white and purple flowers.